Discrete 4 is a console-grade discrete microphone preamp interface. The Premium Upgrade Pack lets you use the large collection of 70+ FPGA FX directly in your DAW. The Discrete 4 Premium Upgrade FX pack allows you to use 4 channels with 4 FX instances each, which is twice what you get with the Basic FX pack. The Discrete 8 Premium Upgrade FX pack allows you to use 8 channels with 4 FX instances each, which is four times what you get with the Basic FX pack. All of those can now be used in your preferred DAW with the AFX2DAW plugin provided in this premium pack. 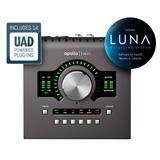 The Premium FX pack allows you to employ the full studio power of the Antelope Audio real-time FPGA FX. The collection features authentic models of iconic studio units from BAE, Gyraf Audio, LANG and Grove Hill. The Discrete 4 Premium FX pack allows you to use 4 channel strips with 4 FX instances each and up to 16 channel strips using the new AFX2DAW plug-in. The Premium FX library features 60+ Antelope Audio real-time FPGA FX, including Vintage EQs, Compressors, AuraVerb, Guitar Amps & Cabinet models. 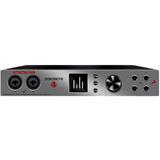 Antelope Audio's Discrete 4 Microphone Preamp Interface brings a new level of sound quality and power to home studios and mobile recordists. 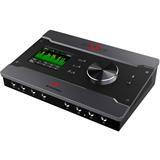 It comes with 4 console-grade, 6-transistor discrete preamps, 121 db dynamic range conversion and rock solid clocking. 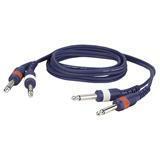 Both the Discrete 4 and the Discrete 8 come with DC coupled analogue line outputs to be used at CV (control voltage) interfaces. Primarily for recording with and taking full advantage of analogue synths. 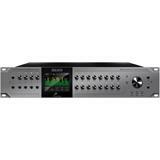 Discrete 4 features all of the Antelope Audio premier real-time FPGA FX, including authentic models of iconic gear from BAE, Lang, Gyraf Audio and many more. The Antelope AFX platform is based on a rapidly expanding hardware modeling engine. Discrete 4 includes Accusonic microphone and preamp models, guitar amps, transformer and tube FX, and a huge selection of classic vintage gear, which are now accessible in the DAW via the new ConnectAFX Plugin. Discrete 4 is a 14 in and 20 out interface featuring 4 analog ins, 4 analog line outs, stereo monitor outs, 4 headphone outs and 2 ReAmps. Additional digital connectivity comes on S/PDIF and 2 ADAT's. 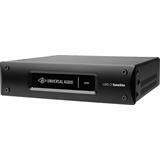 Discrete 4 was developed after an extensive research of legendary microphone preamp circuitry. Its console-grade and fully discrete preamps were hand designed to offer world-class sound. The powerful Antelope Audio FPGA engine can transform these already expensive sounding Accusonic preamps into classic units via Tube, Transformer and FET based circuitry. It's all happening real-time. 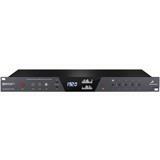 Both the engineer and the performer can instantly hear the authentic blends of 10 different mic preamps without any latency or annoying comb filtering. The microphone source can be recorded with and without Accusonic modeling. 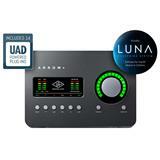 This allows the engineer to experiment with different preamp models during mixing. The entire signal path was designed for optimal sound with any microphone and it really shines with Antelope's new Edge and Verge microphones. 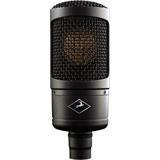 These new microphones were specially designed for the Discrete 4 preamps and feature matching discrete electronics. The real-time FPGA platform offers a complete professional studio experience – Microphones, Preamps, Conversion, Compressors, EQs, Reverb and latency free Monitoring. All this backed up by Antelope's signature Clocking and combined into one unified system with instantly recallable Presets. You can even load AFX Presets from VIP Masters with their favorite combinations of FPGA FX that are used daily on their own award-winning mixes. Traditionally, interface preamps are comprised of only 2 transistors, which makes them a hybrid between transistors and IC chips. Antelope Audio incorporates a fully discrete design consisting of 6 accurately matched transistors, yet maintaining the advantages of digital control and repeatability of gain levels. Field effect transistors add an expensive-sounding touch of warmth and naturalness to the sound. Bipolar transistors keep THD and noise extremely low, which is quite uncommon in a discrete design. Antelope's console grade 6-transistor discrete preamp is exceptional and unique. The Discrete 4 mic preamps were the first step of the device design process. 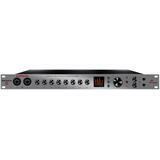 Unlike other units where mic preamps are added to the interface, the Discrete 4 preamps are actually what the device is centered around. For 25 years, Igor Levin has led the world in pro audio clocking technologies. His proprietary clocking techniques and secret jitter management algorithms have been at the core of the Antelope sound in all of their products. The Discrete 4 is no exception. 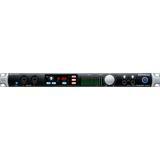 In fact, this mic preamp interface is a professional clocking solution in its own right. It features Antelope's 4th Generation 64-bit Acoustically Focused Clocking (AFC) technology from the highly acclaimed Trinity, OCX HD, LiveClock, Pure2, Goliath, Orion, and Zen products. Discrete 4 comes Two WC outputs allow you to distribute clock to your other digital gear and mic preamps in your setup connected via ADAT and S/PDIF. Discrete 4 will ensure all your gear is perfectly synced. Discrete 4 has a comprehensive and easy to set up Monitoring section. A band can have up to 4 individual monitoring mixes with FPGA FX included sent to it's 4 Headphone Outs. The engineer can make custom headphone mixes for each performer. Effects can be included to allow artists to hear sound closer to what will be on the record. Users can create custom presets to easily setup various tracking scenarios in a snap. 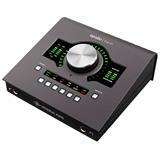 The front panel features an assignable monitor volume knob to control level of the Stereo Outs and individual Headphone Outs. Metering is viewable on the front panel display, inside the EasyPanel and also via the remote App. • Width: 261 mm / 10.2"
• Height: 44 mm / 1.7"
• Depth: 208 mm / 8.2"